All the Brews Fit to Pint: The Every Two Weeks in Beer: To Summer Beer Festival and Beyond! The Every Two Weeks in Beer: To Summer Beer Festival and Beyond! It’s an especially good time to be a beer lover in Washtenaw County. Why? Because the state’s oldest and largest beer festival, the Michigan Brewers Guild Summer Beer Festival, is this weekend, that’s why. And, after that, there’s this new thing called Ypsi-Arbor Beer Week from August 1-9, featuring a smorgasbord of brewy delights all throughout the area – so many, in fact, I can only cover some of them here. For the full and still-evolving schedule, check out visitypsinow.com/yabw. 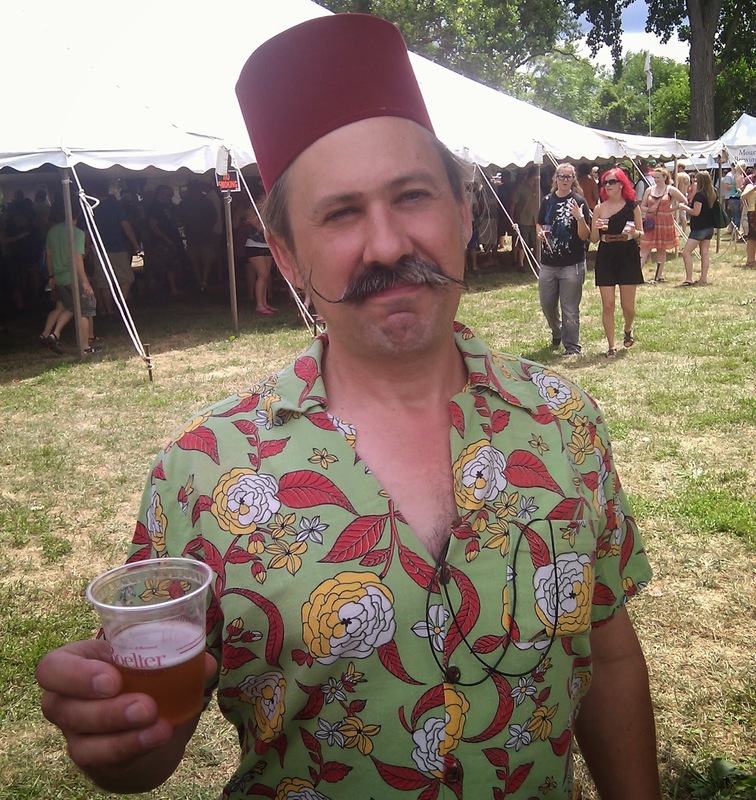 » Happy Michigan Brewers Guild Summer Beer Festival Eve! Ashley’s is welcoming the signature event of the Great Beer State with a special tapping of 20 selected Michigan beers, beginning at 6 p.m. You won’t want to miss this eclectic lineup, which includes Arcadia Imperial Stout, Bell’s Hopsoulution Double IPA and Bourbon Barrel Kalamazoo Stout, Brewery Vivant Escoffier Brett Ale, Cheboygan Blood Orange Honey Ale, Dark Horse Reign in Blood Orange Ale, Founders KBS and Sweet Repute, Fenton Bloomin’ Berries, Kuhnhenn DRIPA, New Holland Bourbon Barrel Doppelbock (cask) and Incorrigible White Sour Ale, Original Gravity Rye-Headed Stepchild, Right Brain Spear Beer, Short’s Stache Bender Double IPA, and more. Ten will be tapped at a time and replaced as kegs kick. » The New Holland beer dinner at Grange Kitchen & Bar, 118 W. Liberty St., begins at 6:30 p.m. The menu will feature a summer harvest dinner designed by Chef Brandon Johns and New Holland partner (and farmer) Fred Bueltmann, who will be spending the day prior visiting local farms and businesses for the freshest and deliciousest. Tickets are $60, excluding tax and tip, and can be purchased here, if still available. » If you’re doing anything other than heading to Riverside Park in Ypsilanti for the Summer Beer Festival – now featuring more than 800 beers from over 80 Michigan breweries – you’re doing it wrong. The fest runs from 5-9 p.m. Friday and Saturday from 1-6. (Michigan Brewers Guild Enthusiast members get in an hour early, and it’s worth it.) Saturday’s session is sold out, but as of this writing $35 tickets were still available for Friday. Go to mibeer.com to purchase, or if you simply must go on Saturday, my recommendation is join the Craft Beer in Michigan Yahoo group, and post on there. People sometimes abruptly can’t go and need to sell their tickets. » OK, I lied. There is one other great thing for you to be aware of on Friday: Buck-a-shuck Oyster and Beer Happy Hour at both Whole Foods locations, 990 W. Eisenhower Pkwy. and 3135 Washtenaw Ave., from 4-7 p.m. Just like it sounds, various oysters on the half shell are $1 apiece and they will be paired with selected beers or wines as you desire. I just drooled on myself a little while writing this. » Be at Ashley’s when midnight rolls around for the August 1 tapping of the latest in Founders’ Backstage Series of beers, Dissenter Imperial India Pale Lager. The hopped-up 8.7% ABV brew is the first lager Founders has made in a dozen years, and it’s fermented with a different yeast strain than the one they use for their other beers. Says co-founder Dave Engbers: “With Dissenter, we’re releasing yet another Backstage Series beer that doesn’t fit within standard beer style guidelines. And that’s the point. It’s a celebration of the creativity of our brewing team, and we’re looking forward to sharing it with the growing circle of beer enthusiasts.” Be among the first to try it. » Ever wonder what makes a beer tick? Come back to Ashley’s at 6 p.m. to find out what goes into the blending and making of Bell’s Black Note Stout. On tap will be constituent brews Special Double Cream Stout and Expedition Stout, and you can also sip some Four Roses Bourbon, the barrels of which are used to age the blended beer. And, of course, Black Note itself will be available for you to compare with its ingredients. » Later in the day, head over to Fraser’s Pub, 2045 Packard Rd., to celebrate the venerable townie bar’s 51st anniversary and International IPA Day with an Arbor Brewing IPA tap takeover. Look for Buzzsaw IPA, Hoptown Brown Ale, Sacred Cow IPA, and the exclusive Fraser’s 50 Imperial Rye PA, originally brewed for the pub’s 50th anniversary last year. The fun begins at 6 p.m.
» Ypsi-Arbor Beer Week continues, of all places, at Zingerman’s Creamery, 3723 Plaza Dr., which is hosting a series of cheese and beer pairings. First up at noon is Oskar Blues Brewery from Colorado, followed by Detroit’s own Atwater from 2-4 p.m., and finally Rogue out of Oregon from 4-6. The best part: Samples are free, or at least they are until somebody comes to their senses because like what? Yay Beer Week! » Do more beer and cheese at Zingerman’s Creamery beginning at noon with Epic Brewing of Salt Lake City. Then at 2 p.m., switch gears for some cider and cheese with Michigan’s Vander Mill. » Time once again for a relaxing day in the beer garden at Arbor Microbrewery, 720 Norris St., Ypsilanti, as the Halcyon Sundaze crew busts out another round of songs reminiscent of yesteryear, futurefunk, throwback soul, and AM Gold. Don’t miss out on the specialty Halcyon Brew on tap, $1 records, and local artists. It’s also the annual Backyard BBQ, with a smoked pig courtesy of Mike “Beerguyver” O’Brien and delectable side dishes served up from the brewery kitchen. Event goes from 2-9 p.m.; pig and fixins are available beginning at 3 until they’re all gone. » Bill’s Beer Garden, 218 S. Ashley St., is here to help you with your math, specifically the problem of what 2+2+1 equals. The answer, in case you didn’t know, is FUN. Beginning at 6 p.m., check out two beers from Paw Paw Brewing, two beers from Latitude 42 Brewing, and one collaboration beer on tap. See? It all adds up. » Earlier this year, Sierra Nevada Brewing launched Beer Camp Across America, a cross-country tour of collaborative brewing featuring some of the country’s greatest breweries. Once such brewery is Michigan’s Bell’s, who worked with Sierra to create Maillard’s Odyssey Imperial Dark Ale, a rich, roasty ale named after the so-called “Maillard reaction” that results in caramelized, toffee-like flavors in beers like this one. Taste it on tap at the Wurst Bar, 705 W. Cross St., Ypsilanti, beginning at 7 p.m.
» It’s “Rock Your ’Stache” Night over at World of Beer, 1300 S. University Ave., when they put on four Southern California beers and screen Anchorman beginning at 8 p.m. Stay classy, Ann Arbor. » It’s been a while since Sidetrack Bar & Grill, 56 E. Cross St., hosted one of its signature beer and burger pairings, but happily another one is slated from 7-10 p.m. This time, it’s an all Bell’s offering, including Black Note Stout and several other tasty brews paired up with different gourmet mini-burgers. Tickets are $30 and will likely sell out in short order; call 734-483-1490. » Bring your pooch to the Daytime and Dogs event at the Wine Seller, 2721 Plymouth Rd., which is hosting a fundraiser for the Humane Society of Huron Valley from 4:30 to 7:30 p.m. Lagunitas Brewing reps will be on hand serving up beer samples and hot dogs in the big tent in front of the store, and a dollar from every six-pack purchase will go to HSHV. Make a donation and get a free Lagunitas pint glass. » Café Felix, 204 S. Main St., is weighing in on Beer Week with a special event of its own: All About Lambics. Details are sparse as of this writing, but needless to say, if you’re a fan of this funky Belgian style, you’ll want to check it out. Reservations are required; call 734-662-8650 for more info. » At the Arbor Brewing Brewpub, 114 E. Washington, from 6-7 p.m. look for the official release party for Hoptown Brown Ale, a brew chock full of citrusy hops and nutty, toasty malt flavors. Includes beer samples, light snacks, and a chat from a brewer about the beer. Cost is free for Mug Club members, or $10 for the uninitiated. » If Muhammad won’t go to the tap room, then the tap room will come to Muhammad. That’s the idea behind the Odd Side Tap Room Road Trip event at Ashley’s, beginning at 6 p.m. Chris Michner, brewer/owner of Odd Side Ales, brings over a portfolio of what are normally their pub-only beers as well as a firkin of cask conditioned ale. And no, your name doesn’t actually have to be Muhammad to attend. It’s just a saying, you know? » From 6-9 p.m. is the monthly Brewer’s Night at Grizzly Peak, 120 W. Washington St. Enjoy discounted beer samplers, tours of the brewery, and a little sumpin sumpin out of a specialty cask. Be sure to show up around 8:50 and ask for the tour. Head brewer Duncan Williams loves that. » Hungry? Then maybe you want to check out the five-course German dinner at the Heidelberg, 215 N. Main St., from 7-9 p.m. Each course will be paired with a different brew from Victory Brewing of Pennsylvania, who make some damn fine beer if you ask me. Tickets are $35; call 734- 663-7758 to reserve. » Football season is still a few weeks away, but why not get in the mood for another season of Wolverine action with the Michigan vs. Ohio Throwdown at Bill’s Beer Garden? Beginning at 6 p.m., look for beers from both states on tap and decide which are your favorites. For once, this is a contest Michigan should win handily. Hey-o! » Sidetrack Bar & Grill is putting together a special evening of New Belgium beers: Every Lips of Faith collaboration beer brewed in the past two years. If you’ve ever had any of the beers from this series, you know they’re often something special. Get an idea of what you’re in for here. Event begins at 7 p.m.
» Head up to Carson’s American Bistro, 2000 Commonwealth Blvd., from 4-7 p.m. for a leisurely stroll through some tasty appetizers paired with Sam Adams beers, plus a chance to win local “bucket list” prizes. » Bill’s Beer Garden gives an 11-tap salute to Arbor Brewing beginning at 6 p.m. Enjoy everyday and specialty beers from the longtime local faves. » Are you experienced? If not, you can get that way at Ashley’s with The Trappist Experience, a sampling and learning session led by beer expert John Staunton, who works directly with several Belgian monasteries to import the monks’ beers into the U.S. John will give a 45-minute presentation, then take questions for 15 minutes as you sample from Orval, Rochefort, and Westmalle breweries. Two sessions are available, 6:30 and 7:45 p.m. Tickets are just $10 and can be purchased online here. And be sure to stick around for dinner: Ashley’s is also offering a Belgian beer-infused menu of snacks.